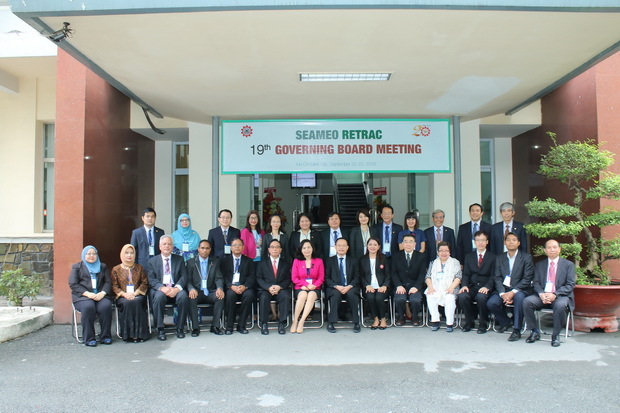 SEAMEO RETRAC’s 19th Governing Board Meeting was convened from September 22-23, 2016 at the Center. The Meeting was held back to back with the Educational Forum, namely “Education Innovation for an ASEAN Integration”. 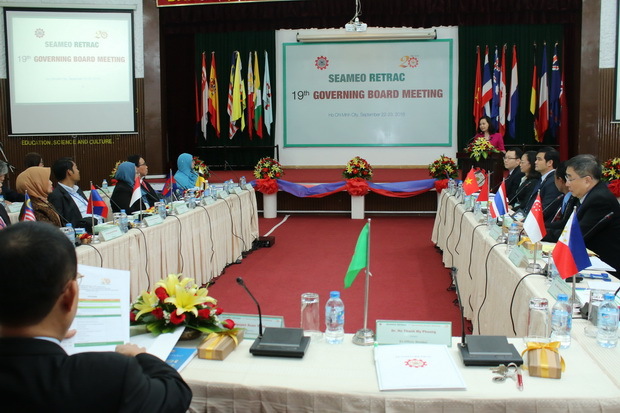 Attending the Meeting were Dr. Witaya Jeradechakul, former Director, SEAMEO Secretariat; Dr. Ethel Agnes P Valenzuela, Deputy Director, SEAMEO Secretariat; Governing Board Members and representatives coming from Southeast Asian countries, and observers. In her opening remarks, Dr. Ethel Agnes P Valenzuela congratulated on the Center’s achievements for the past FY 2015-2016, and encouraged its continued strong linkages with institutions and organizations galore within and outside the region. At the Meeting, Dr. Ethel Agnes P Valenzuela presented a brief report on the agreements and actions taken from SEAMEO Meetings for FY 2015-2016. Also, the Board approved the Center’s annual report for FY 2015-2016 and the action plan for FY 2016-2017 which were presented by Dr. Do Thi Hoai Thu, Dean, Division of Education, and the financial report for FY 2015–2016 by Mr. Nguyen Tan Hung, Head of Planning and Finance Department. The Board Members unanimously approved the Center’s annual report and financial report. The Meeting ended with the endorsement of the proceedings. This year’s Meeting also included the visit to Le Quy Don High School in Ho Chi Minh City on the afternoon of September 22. This was a great chance for the Governing Board Members, representatives and observers to understand more about basic education in Ho Chi Minh City. After the Meeting, the Board Members joined a retreat to the Mekong Delta on September 24, 2016.